You don't often see our products in the news, but just recently the Inspiration Paediatric Cot appeared in various newspapers. 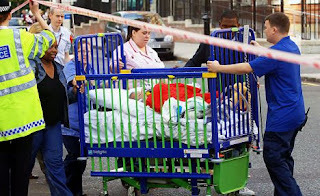 On 30th September a fire broke out in the cardiac wing of the Great Ormond Street Children’s Hospital. About 40 young patients, plus about 300 families and staff, all escaped the blaze. Thankfully no-one was hurt. You can see one of the children being pushed to safety in one of the Inspiration cots. If interested you can read more about the fire in the Daily Mail.